Welcome to a brand new blog post! I went to try a sweet dish, at the well known brand Icestone Gelato, and I thought that today, I would tell you all about, what I had and my opinion on the dish. Icestone aims to be the ultimate dessert experience, with an range of gelatos and desserts. 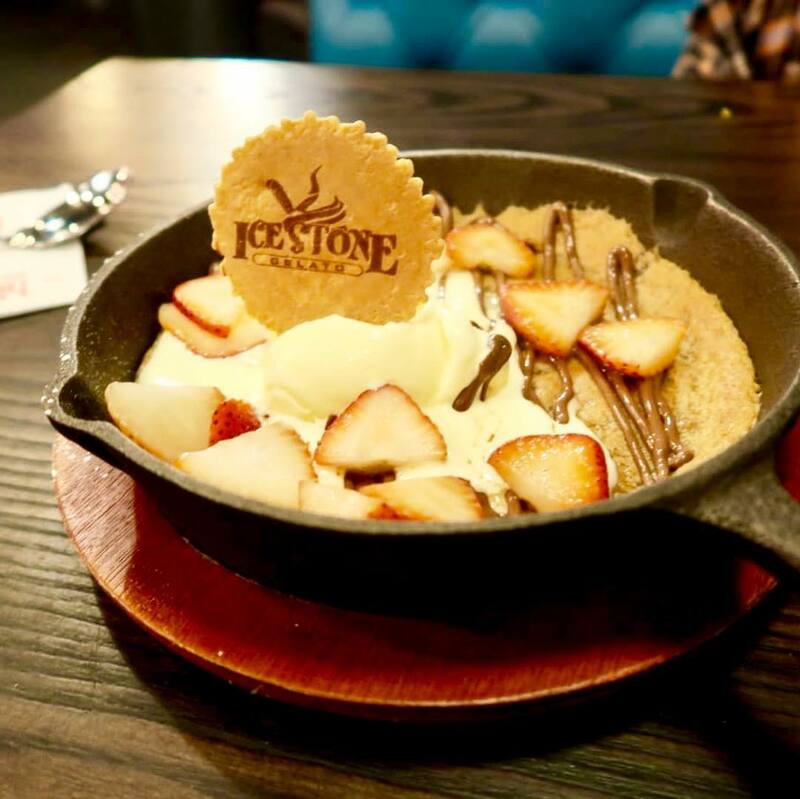 Icestone's Waffles, Crepes and Cookie Dough are made via their own secret recipe and as their other desserts, they have sought out the cream of bakers all over the North-West and commissioned the best cakes, cheesecakes and puddings from them. I decided to go into Icestone Gelato, with, Jim when they came up to Leeds. (He also came along to Trinity Kitchen to try out some food. Click here if you want to read all about that.) We walked in, found a cute booth to sit and chat in, and snapped some pictures of the interior of the building. The dish came to the table, and I already could tell that I was going to love it. You could tell that it was made with love and passion, just from the look of it. The rich Chocolate spread against the cool refreshing taste of Strawberries was amazing. The contrast between the crunchy hard exterior, and, the gooey interior was amazing. I'm a nerd for texture contrasts. It just makes an eating experience that little bit better. I love Nutella, so, the fact that the Cookie Dough was full of it, made me very very happy. The Vanilla Gelato, was rich, creamy, and, heavenly. The coldness against the hotness was orgasmic. I also loved it, as, I have slightly sensitive fangs (honeatly my teeth are as sharp as knves), so the sort of soft to near melted ice cream was a little bit melted for me. Some may think that, the dessert as a whole would be a bit sickly, but the Vanilla and Strawberry flavours, helped to cut through all of the sweetness. I reassured myself that it was fine to eat all of it, due to the Nuts and Strawberries. I mean, Nuts are always good for you, and, so are Strawberries, therefore it's healthy! Icestone also do a plethora of sweet treats, including, sundaes, puddings, and, freakshakes, so I'm sure that I'll be back very soon. Have you been to Icestone Gelato before? Let me know down below! I hope that you have enjoyed this food based blog post! I hope that you come back for a new post!